Hey Fellow Alfred Builders.... This workflow provides a simple integration app for Word Counter. With a keyword, you can display your latest word counts from previous days and months. 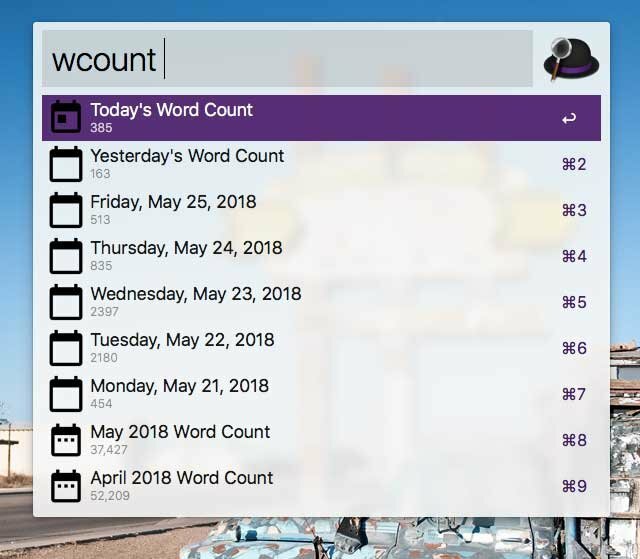 Word Counter is a tool that runs in the background and tracks how many words you type per hour on a configured list of programs. Data is saved locally. Been using Alfred for several months and thought I'd work on my python coding by building this. Looking to add more features as I better understand how to interact with Alfred. You can download it from http://www.packal.org/workflow/word-counter-app or check out the code on https://github.com/markwk/alfred-workflow-wordcounterapp. Feedback, comments, bug reports and issues are welcome!